What does it take to really excel in the world of elite sport? The ability to deliver your best when it matters the most is a fundamental part of performing under pressure. Can this ability be taught, learned and developed? We have previously explored why some athletes perform better under pressure than others and what it takes to thrive in a pressurized environments. However, what makes emotions in sport so complicated is that no emotion is truly good or bad during competition. For example, anger can make you try harder, but it can also make you lose focus on the task at hand. Even two people experiencing the same emotion can react in different ways. So a footballer who is embarrassed about missing too many shots may shy away from receiving the ball, whereas another might react by calling for it more to get a chance to redeem themselves. Research by Professor Marc Jones at Staffordshire University offers fascinating insight into how athletes can better manage their emotions when competing. 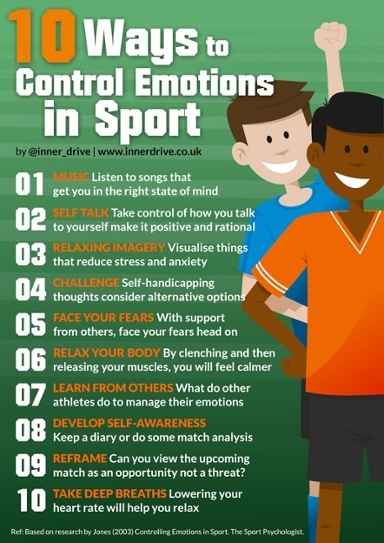 In this two part blog series, we are going to look at 10 tips to control emotions in sport based on his research. Music: Listening to music is a great way for an athlete to get into the zone. Upbeat or inspirational music for example improves an athlete’s confidence and motivation, leading to better on pitch performance. Music acts as a way to boost arousal levels whilst also helping to block out distracting thoughts. Self-Talk: Negative self-talk leads to a poor emotional state, which in turn hurts athletic performance. Replacing it with positive self-talk such as “I played really well in my last match” or “I’ve succeeded at this before, I know I can now” counters negative emotions and creates positive ones too. This positive self-talk creates helpful emotions such as happiness. As many as 76% of elite level figure skaters utilise this technique to cope with the stress of competition. For more tips on how to talk to yourself, check out our blog on it here and how self-talk is linked to growth mindset. Relaxing, Positive Imagery: If you find yourself stressed out over competing or are worried about failing, try imagining positive scenarios like scoring a goal. As a young athlete, Wayne Rooney used to lie in bed imagining himself scoring goals and dribbling around defenders. He uses these visualization techniques this day and credits them for his accomplishments. It has been found that Imagery focused on toughness, control, and confidence leads to increased motivation, emotion regulation, and self-belief. This is a great technique to do the night before a match or just before you go out to compete. Challenging Self-Handicapping Thoughts: It’s important to consistently review your behavior both on pitch and off to ensure it is helping, not hindering your performance. If you are exerting energy and focus on behavior that is hurting you, you’re wasting energy. One elite tennis player in this study was asked how many times in her career she argued with the referee and how often it had actually resulted in a call being changed (very rarely). The massive difference in the energy wasted compared to the result she gained, helped her realise there were better things to choose to focus on. Face Your Fears: As discussed in our blog on The Fear of Failure, psychologists believe that there are three ways people cope with situations. These are Avoidant, Emotional and Problem Focused. Let’s say you are worried about snakes in your garden. You could decide to never go into your garden again (avoidant focused), or convince yourself that having snakes in your back garden isn’t that bad (emotion focused) or go into your garden and get rid of the snakes (problem focused). Whereas avoidant and emotional focused coping may provide a short relief, problem focused coping addresses the issue head on, allowing you to make long term gains. Don’t be an ostrich and bury your head in the sand. If something is worrying you, work out how you can make it better. Make sure to check back in a few weeks for part two of our blog on how athletes can better manage their emotions. We would like to massively thank Professor Jones for allowing us to blog about his research.